On the shore of Lake Lure, a beautiful mountain resort checks all the boxes for a fun and relaxing family vacation. On the north shore of Lake Lure in Rutherford County, situated beneath the granite cliffs of Rumbling Bald Mountain, sits the 2,900-acre Rumbling Bald Resort. The picturesque retreat boasts stunning natural beauty and endless opportunities for adventure. It’s the perfect home base for exploring the surrounding Blue Ridge Mountains — if you ever feel like leaving the white-sand beach, that is. One hour from Asheville; an hour and a half from Greenville, South Carolina; two hours from Charlotte; four hours from Raleigh and Atlanta; and six hours from Richmond, Virginia: You can reach Rumbling Bald from all over the Southeast — without spending too much time in the car. While other parts of the state bake during peak summer months, the temperature around Lake Lure averages about 75 degrees, making it a cool, refreshing place to escape. Need a getaway? It’s time to give yourself the vacation you’ve been missing! 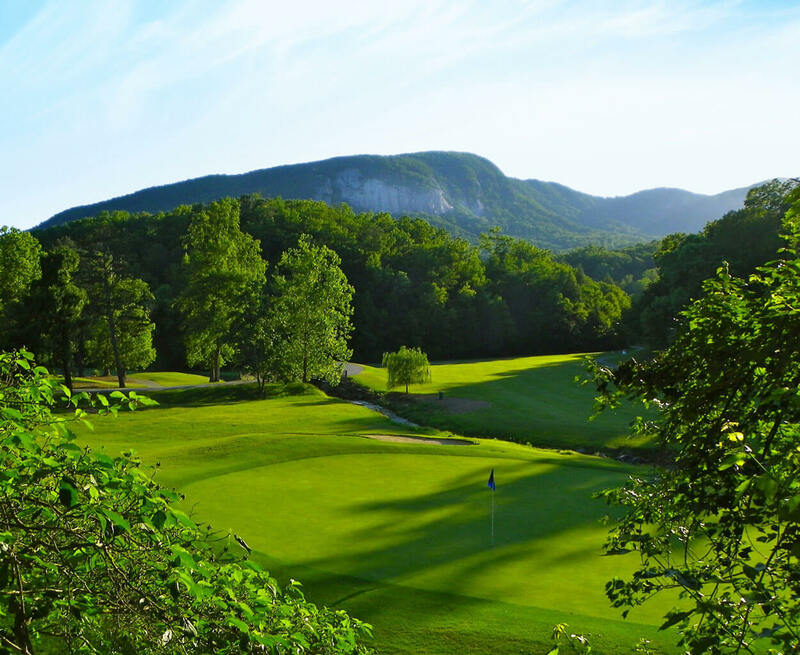 Rumbling Bald Resort, on beautiful Lake Lure, invites you to its private white sand beach, distinctive dining, hiking, biking, and two world-class golf courses. 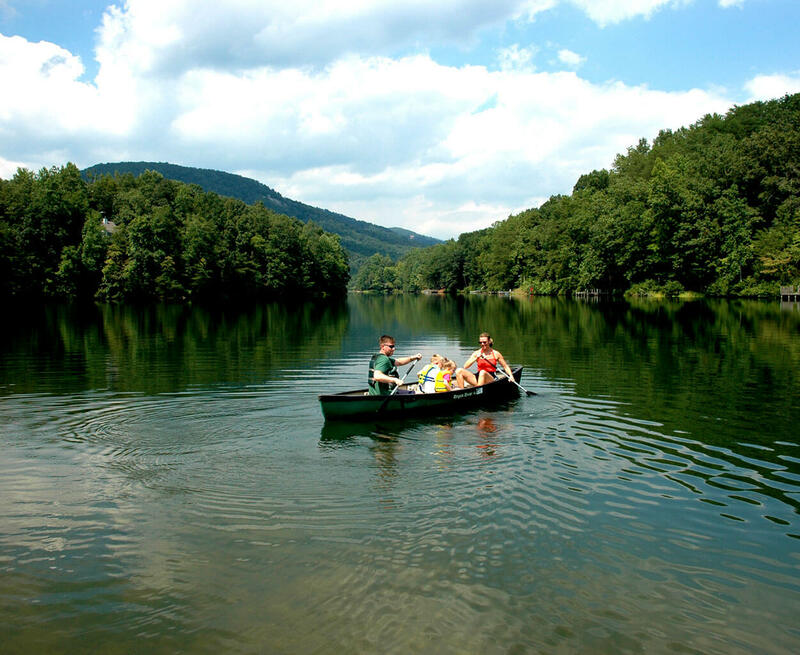 Ringed by mountains and large granite outcroppings, Lake Lure has nearly 24 miles of shoreline to explore. Spend the afternoon on the private North Shore Beach, where you can swim in the lake and lounge on the white sand, then grab an ice cream cone from the North Shore Beach Cabana, the resort’s lakeside headquarters. Rent a paddle boat, canoe, kayak, or stand-up paddleboard from the cabana and explore the lake’s bays and inlets. For something more leisurely, captain a pontoon boat for an hour or two and socialize with friends as you venture across the water. Alternatively, hop aboard a scenic lake cruise that leaves from the Cabana multiple times each day. While on board, you’ll learn about some of the legends of the lake and the natural and cultural history of the area, as well as visit landmarks that appear in Dirty Dancing, which was filmed, in part, on Lake Lure in the late 1980s. The resort also offers lunchtime cruises that make an hour-long stop at a lakeside restaurant, and wine cruises, which feature a dockside tasting and a glass of wine to go. Cheers! Two 18-hole golf courses, both of which have a Golf Digest four-star rating, make Rumbling Bald a golfer’s dream destination. The Bald Mountain course, situated beneath rocky cliffs, was designed by William B. Lewis and built in 1968. The nearby Apple Valley course, designed by Dan Maples and opened in 1986, features a beautiful and secluded back nine near Youngs Mountain. Buffalo Creek Park, a 1,527-acre park system accessible from the resort, offers miles of trails for hiking and mountain biking. 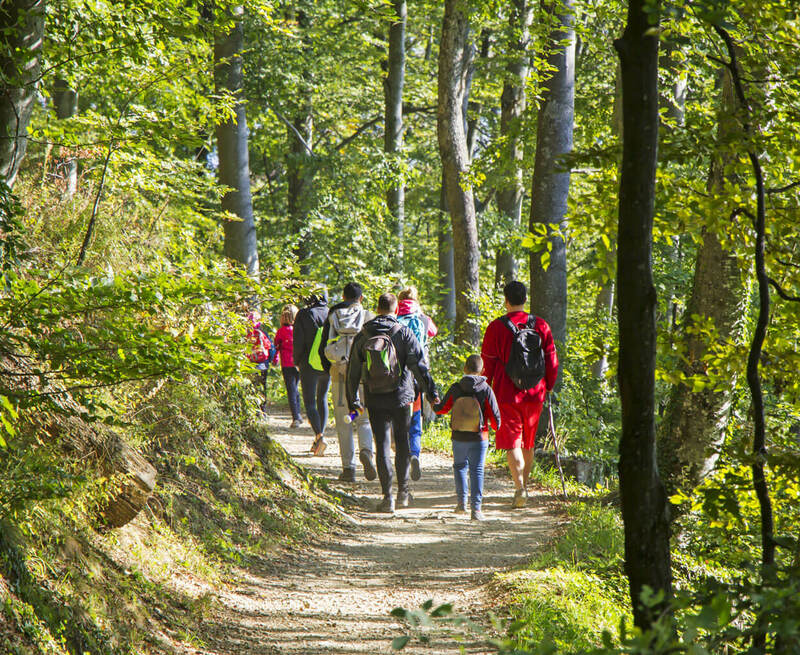 Spend an afternoon walking or pedaling through the hardwood forests, appreciating the rhododendron-lined creeks and large granite boulders that make the area a popular destination for rock climbers. Prefer to work out indoors? Head to the Wellness Center, where you can lift weights; run; take a yoga, strength, or Tai Chi class; swim laps; and relax your muscles in a hot tub, steam room, or sauna. Or tap into your competitive spirit outside: Four tennis courts down by the lake are open to guests and host round-robin tennis and pickleball games multiple times a week. Nearby, you’ll find basketball and sand volleyball courts, too. At the Rumbling Bald Kids Adventure Camp, counselors lead kids in a variety of on- and off-resort activities. They zipline through tree canopies, ride horses, mine for gems, go tubing on the lake, kayak and paddleboard, and play tennis, basketball, and group games. The resort also offers less structured kid-friendly options, like a playground, an 18-hole mini-golf course, a swimming pool and lazy river, and a game court containing corn hole, horseshoes, and giant chess. If you’ve worked up an appetite on the lake, you don’t have to venture far. At Rumbling Bald, you can choose between a sports bar, a barbecue joint, and an intimate farm-to-table restaurant. At Legends on the Lake, you’ll find pool tables, arcade games, and a patio overlooking the water — plus burgers, salads, and handmade pizzas. At Pinnacle Southern Kitchen on Apple Valley Golf Course, you can satisfy a craving for barbecue and other down-home cooking. And at The Gardens on Bald Mountain Golf Course, you can escape to a quieter setting overlooking the chef’s produce garden, and order from a fresh, seasonal menu and extensive wine list. Lake Lure and Rumbling Bald host several festivals and events each year. 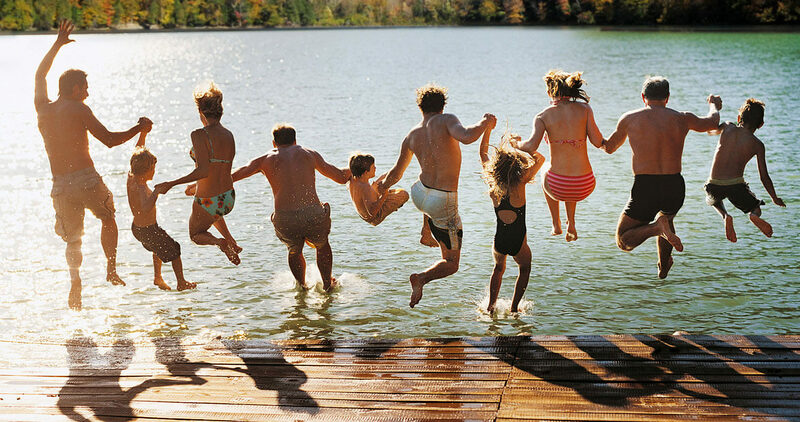 Celebrate the Fourth of July at the resort with a beach cookout, family games, and a fireworks display over the lake. In late August, Rumbling Bald hosts its annual end-of-summer Lake Lure Olympiad, where you can compete in a triathlon or a golf or pickleball tournament. And in September and October, the resort hosts the annual Vintage Tin Car Show and EuroClassic car show. Perhaps best of all, Lake Lure hosts the Dirty Dancing Festival each September to celebrate the cult classic movie filmed there three decades ago. View a lakeside film screening, carry a watermelon like Baby, learn to shag dance, and attempt the iconic swan lift in the lake. Plus, this year, Rumbling Bald will host the first-ever after-party, with live music and dancing on the beach. Toast your way through western North Carolina on an all-day, resort-led wine tour that transports you between four different wineries and includes lunch. Saddle up for a one-hour trail ride or a two-hour river ride (prepare to get wet!) with Riverside Riding Stables, the closest stable to the resort. Or set off on a trail ride through the forest and across laurel-lined creeks with Cedar Creek Riding Stables in Lake Lure. Both operations offer pony rides for little ones. Giddy up! On top of Chimney Rock, a 315-foot-tall granite outcropping, you can see for miles — 75, to be exact. A mere 20 minutes from the resort, Chimney Rock State Park has picnic areas, nature workshops, and hiking trails. On a rainy day, head to The Right Track Toy Train Museum in Lake Lure, where you can view a wide collection of model trains that kids can help operate. Or visit the KidSenses Children’s Interactive Museum in Rutherfordton, where you’ll find two floors of play-based, interactive exhibits. Giant bubbles, anyone? If you’re in the mood to shop, head to downtown Black Mountain (30 minutes away) or Hendersonville (50 minutes away), where you’ll find small, local galleries and shops selling jewelry, arts and crafts, books, and more. In Lake Lure, stop to smell the flowers at the nearby Lake Lure Flowering Bridge, a 155-foot-long garden created on a historic bridge built in 1925 and closed to traffic in 2011. The adjoining village of Chimney Rock, comprised of Old West-style buildings constructed in the 1920s and ’30s, features cafés, ice cream stands, gift shops, a winery, and a brewery. The town’s River Walk, which runs behind the buildings on Main Street, gives you an up-close view of the Rocky Broad River as it rushes toward Lake Lure.